I’ve been banging on about touch for about 4 years now and in the last year we’ve finally seen a few bits of software have a go at being a bit more touch compatible. Open Lab’s StageLight has been ruling the roost with the best overall touch experience, Image Line’s FL Studio has some great implementation throughout and PreSonus’ Studio One embraced it with some excellent and awful results all at the same time. However, largely what they’ve done is bolted touch support into an existing mouse/keyboard paradigm. The ability to move more than one knob or fader of course goes beyond what a mouse can do but it’s also the sort of thing easily done with a MIDI controller. What we haven’t seen is someone looking at the sort of input touch offers and being creative with how that can be used – this is particularly true of the Surface digital pen. Perhaps a good example is the difference between Sibelius and Staffpad. Sibelius has implemented touch and the Surface Pen into their score writing software but it essentially replaces the mouse with the pen and works very well at letting you input notes. Staffpad lets you write actual notes using the pen as a pen and then uses clever technology to convert that input into a digital form. Now, from what I’ve seen Bitwig have taken the creative approach. They’ve taken notice of how touch works and developed a way of using that which makes sense. Intrigued? Good – let’s take a look. Bitwig have this thing called Display Profiles which give you a different layout depending on the sort of screen arrangement you have. In version 1.3 they introduced a new one called “Tablet” so we’re going to select that and then load up a demo song. Do note that I’m using version 1.31 here as there was a particular view missing in the original release of 1.3 that’s been reintroduced in 1.31. The tablet layout is quite different. The browser and inspector windows have gone, as has the edit tools, we have this sort of broken chess board in the middle, a good sized row of buttons at the top and our view buttons on the side. The menu system has been absorbed into a hamburger style menu which feels a little clumsy when trying to open a project and you immediately miss your mouse or trackpad – got to be a better way to do that – but you can finger about and make it work. It all looks a bit chunky – but that’s ok, in fact that’s good, that’s what we want when using touch so that’s the display scaling boxed ticked. In Tablet mode you have four views – Play, Edit, Arrange and Mix, each are pretty self-explanatory but let’s take a look at how touch is handled. After loading the “Overclock” demo song what I have before me is an awesome bunch of drum pads that are totally playable. I’m running this on my Fast Track Duo at 128 samples and it feels pretty darn good to me. Above the pads we have the Device panel showing the devices on the currently selected track. Above that is the selected track in the arrange page, but just that track, just the one presumably in order to conserve space – which is all pretty sensible except how do I see the other tracks? Well to the left is a pair or arrows and a drop down menu. The arrows step you up and down through the tracks or you can use the drop-down to select a track directly. That’s really very neat. As you step up and down the drum pads change to a keyboard layout if it’s an instrument track and back to pads if it’s a drum track. For any track you can change the keyboard layout from the menu on the right. The broken chess board is an isommorphic keyboard which, amongst other things, allows you to play the same chord in the same shape regardless of the key, you then have a regular keyboard or one with stacked octaves, and finally the drum pads. They haven’t gone out their way to make them beautiful but they are certainly going to come in handy. One thought I had is that StageLight has an awesome virtual keyboard system where can specify a key or mode and have a keyboard fixed to those notes – it might sound a bit unmusical but actually it’s really useful for hitting the right notes in a bit of jamming – I love to see that here. So far so MIDI controller, but stay with me it gets better. Glass isn’t velocity sensitive, you can pound it all you like and the response will be the same. Bitwig have thought about this and implemented a velocity scale based upon where you strike the note or pad – softer at the bottom, harder at the top. So you can completely effect velocity as you play – that’s fabulous! Let’s skip down the tracks to the Wet Bass and pull up a regular keyboard so that we can easier see what’s going on. As you play the notes there’s a velocity change as you tap towards the top or bottom of the key. If come back up to the drum track you can hear the snare change as I play up or down the pad. But this is only the beginning of the expressive parameters Bitwig has made available to your fingers. As I demonstrated in part 1 Bitwig supports Multidimensional Polyphony Expression which gives us individual note control over pitch, timbre and pressure. Pitch is obvious enough, you tap and drag left or right to pitch each note down or up, with timbre the gesture is to drag forwards and backwards. The pitch parameter is fixed but the timbre on the other hand can be mapped to any available parameter in the Bitwig Device. I can do it on the polysynth where there’s a dedicated “TMB” mapping control – tap “TMB” move the knob you want to control and off you go. It’s interesting that moving the knob a little bit will give you a greater drag resolution. You can’t use this on VST instruments as they wouldn’t have individual per note modulation unless they also support MPE. The expression you can put into your playing is amazing, it’s a whole new world. Suddenly I’m reminded of the recent ROLI Seaboard MIDI controller than everyone is having kittens over – it’s all here in Bitwig. One thing you can’t do however – you can’t trill up and down the keys, it always sees it as a pitch bend – huh – maybe there should be a toggle switch for it. But – that’s not all! There’s one more parameter which they’ve mapped to the Surface digital pen – pressure. It’s available, like timbre, as a mapable controller which you can assign to any available knob. So with the pen you can strike a note, bend it, open the filter by moving forward and lean on it a little to speed up with LFO – total genius. Lots of room for getting in a bit of a muddle but once you’ve got the hang of it it becomes very interesting indeed. With the new Surface Pro 4 and Surface Book the pen has 1024 levels of pressure as opposed to the 256 that the Surface Pro 3 pen has, so that has the potential of giving even greater control. 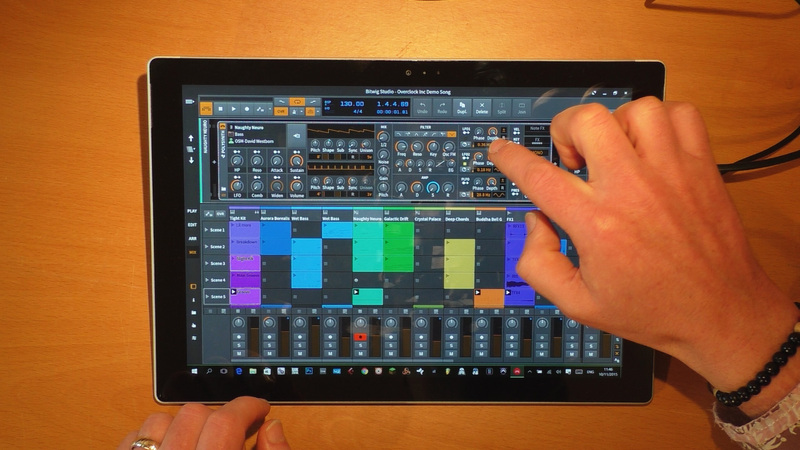 So Bitwig haven’t just given you the ability to play in MIDI data with the Surface screen, they’ve given you an awesomely expressive instrument. Obviously you are still playing on glass and so you don’t get the haptic feedback you get with other MIDI controllers but wow, with a bit of practice this could really be something. Once you’ve fingered or penned yourself a performance you’re going to want to edit it and this is where things often get awkward with fat fingers, however Bitwig has totally cracked this. Put your finger down and look what happens. This is Bitwig’s Radial Menu – it’s so simple and fantastic that it something that should have already existed in Windows already. I guess it does a bit in OneNote, maybe that’s where the inspiration came from, but who cares because this does exactly what you need when using touch. At a very basic level you tap and drag right to create, left to delete, up and down to select. It changes a bit depending on what you’re doing but here’s me putting in notes, here’s me deleting, here’s me moving and selecting. No toolbar to tap, no tool to select or menu to scroll through – how easy is that? PreSonus, are you watching? You can also just tap to add a note of the current grid size and double tap to delete if you find that easier. Once the notes are there you can use your finger to move it about, but if you look at the Radial Menu you have some expanded options – to the right you have copy and angled down on the right and left you have start and end point trimming. Now you can’t get to these with the one finger you have bring in another digit to access these controls. So you kind of tap and then drag off a copy with another finger. The trimming can feel a little awkward at first until you realise you can release the original finger – and then it’s just awesome. The up and down gesture for selecting takes a few moments to get the hang of because you are dragging up or down first and then continuing to drag the timeline or around notes – but it quickly becomes easy. The digital pen doesn’t play very well with the expanded controls because Bitwig sees the pen and fingers differently. So you can’t hold a note with a finger and pull a copy off with the pen, or vice versa. You can happily enter and delete notes with the pen by tapping or using the Radial Menu gestures. I wonder if the new Surface pen with the eraser on the top will let you delete notes with it. If we bring up the note expression lane you can move the velocity and other expression factors for each note. This feels more clumsy with the fingers as it’s a much smaller target and you lose some of the features you get with a mouse – the cursor changing to show you’re on a note, values being displayed on hover, and note auditioning. With the pen the targeting was easier but there’s no mouse cursor help and I kept hitting a weird glitch where holding a velocity stalk suddenly put the note into audition mode and I could find no way of stopping it other than deleting the note. So the expression editing is certainly doable but it’s a little bit tricky – more like any other DAW – which of course feels frustrating because all the other editing is so elegant. Bitwig tell me they are working on ways of improving this. On the audio editing side the Radial Menu has a lot less to do but you can use it to copy and trim samples by tapping in the header. The expressions editor is again a bit troublesome but generally suffers from not having a freehand mode. You can double tap to create a node but I can’t for the life of me move an existing one with neither finger nor pen so there’s definitely some room for improvement here. Expressions aside the note editing with the radial Menu is the best I’ve ever seen for touch in any DAW – and it’s not just for the Edit page. In the Arrange view we have both the regular arrange and the clip launcher but let’s focus on the timeline arranger view first. The zoom and navigation is done with a two finger gesture, as in pinch to zoom or place one finger and dial another round. If you need to scroll left and right then place two fingers down and drag. Easy. Moving clips around takes a little bit more thought. You can tap a clip and drag left and right on the track but you can’t tap and drag up and down to move a clip as this triggers a selection tool. So to move a clip to another track you have to move left or right first and then you can move up and down. It’s very easy to add a clip by tapping in space and dragging to the right (or double tap) but the erase gesture (tap drag to the left) has been removed. Instead we get a “select clips” tool which makes some sense because you are likely to want to drag a box around clips you want to select and it’s more intuitive to tap next to the clip you are going to select rather than above it – although you can do that too. So for deleting clips you have to use the very useful touch toolbar at the top. You’ve got the vitals like undo/redo, duplicate and delete but I’d like to see this developed into a macro toolbar so that you could add a few more buttons for tasks you do regularly – like Studio One has. Once a clip is selected then the Radial Menu changes and you can do copy and trimming like you did with notes in the editor. There’s also a new button, a loop button which you can use to resize the looped section of a clip. The Arrange page is also the place for automation and to open up an automation track you’d usually have to try to tap a very small button on the track header – but look, Bitwig have slapped on a little Radial Menu covering the solo, mute, record enable and show automation buttons – total genius. With the automation track you simple tap and drag to the right to start freehand automating. You can select a chunk and copy it but that’s about it and whatever I try to do I can’t seem to edit nodes individually. The pen gives you a lot more accuracy for creating automation but I do wish you could make the track heights bigger – there was a button in the regular display profile that opened an automation editor, giving you half the screen to play with but sadly that’s not accessible here and even if you go to the regular profile the automation editor doesn’t respond to touch except for double tap to add or delete a node. Hopefully this is an area under development. Arranging and editing in the arrange view is as easy as anything I’ve seen. Bitwig has completely removed the need for an additional toolbar because the Radial Menu, plus a handful of buttons at the top, manages to contain almost everything you need. Back to the performance side of things, which is really what I’m most interested in. The grid is the perfect size for touch and all you have to do is tap a clip to launch it – not tap the little play button like you do with the mouse. That’s one thing that renders Ableton difficult for touch is having to tap on that tiny triangle play button to launch a clip or scene. Something simple like this is so very welcome and instantly brings a smile to my face. The Radial Menu has been streamlined a bit for the clip launcher which makes it a breeze to build up your project. Tap in a space and drag right to create a clip, tap and drag up to move it, left to delete it, right to copy it and down to select it without triggering. The empty space menu also gives you a browse button that you can access with a second finger to bring up the big devices/preset/sample/clip browser so you can dump something directly into that space. You can also drag stuff in from the side browser or the arranger if you want. To edit a clip you select it and tap the Edit button – you can then add notes and expression as before. There are some areas that I think could be improved here. Firstly couldn’t the editor be opened with a double tap or at least a Radial Menu command? Currently I have to tap, drag down to select and then hit the Edit button at the side – this could be simpler or more direct. Secondly the editor should default to showing the entire loop rather than having you zoom out of a continuous timeline. We are mostly dealing with loops in the clip launcher and so the editor could reflect that better. And then I can’t seem to change the loop size in the editor. No amount of tapping or holding or penning seems to allow me to change the start and end points. I could use the inspector to do this but the text boxes are pretty small making it tricky with the finger – although perfectly fine with the pen. Some way of resizing the loop in the editor would be really handy. Recording notes in is pretty brilliant because you have the built in keyboard and drum pads. Just hit a record enabled empty space in the Play view and off you go. It’s also easier when recording on the fly to hit the clip again to stop recording and have it repeat perfectly in time. However if you’re slow to hit the clip then it’ll keep going another bar and the problems with easily changing the loop size come back into play. Creating a clip and then using the Overdub button would solve this problem with MIDI but again not with audio so an ability to easily touch edit the loop point on clips is pretty vital. This is the first version of the Radial Menu, I think they were very keen to get it out with the launch of the Surface Pro 4 and Surface Book so maybe it’s not completely there yet and I think they’d appreciate any feedback they can get on how to develop it to be even more useful. It’s full of great “touches” though – tap on the track header and you can pull up a level fader – love that. The awesome toolbar at the top. The way you can tap on the scene button and use the Radial Menu on all the scene clips. You can’t seem to add a scene though, which is odd because you can add tracks and that uses the same sort of “+” button. So, y’know, it’s not yet perfect. Not a whole lot to say here really. It’s a fully multi-touch mixer, move as many faders as you like. The faders are just a bit stumpy, that’s all. The Session clip launcher view was missing in the version 1.3 but I’m glad to see it returned in 1.31 as this is where I’m most happy in live performance. I’ve now done my first gig with Bitwig and I learned a couple of things. Firstly if you tap and just slightly drag on a clip or scene you select it rather than trigger it. Initially I thought something was going wrong but once I discovered that I was accidentally accessing the radial menu I was able to correct what I was doing – so the tip here is to tap, just tap, don’t do it lazily, make sure you tap and pull off, don’t drag! The second thing was the realisation that I no longer needed my Launchpad – I no longer need a MIDI controller to launch clips or scenes, I can do it directly on the Surface. Now I may still want to use the Launchpad because of its tactileness but I no longer have to and I love anything that simplifies my life – awesome. That also meant that I didn’t need a USB hub, my audio interface was the only device I needed – simplification double whammy. It’s pretty easy really – there’s no way I’m going back to Ableton Live. Bitwig does everything I do in Ableton Live and does it more elegantly and offers more creative opportunities for the Surface user. I’m sure Ableton has depths and functionality that makes it awesome but not in any ways that I’ll personally feel I’m missing out on – it’s been great for me but now it’s time to move on. The key to a touch interface is that it doesn’t want to feel like you are compromising, like you are fudging it and would actually rather be using a keyboard and mouse. It needs to feel like it’s adding something, that it’s enabling you to be creative and helps your work flow. I think Bitwig achieves that and, as I’m always trying to get across, the act of touching and leaning into the screen brings with it a different way of working. And because you don’t feel like you’re fighting with the interface that different way of working is actually quite exciting. Bitwig have totally grasped what implementing touch control is all about. They’ve thought about it, experimented and come up with a pretty simple and yet revolutionary way of interacting with music production software. For performers such as myself using a Surface it is absolutely ideal. The ease of touch and the advantage of the pen become very apparent. The pen is not compulsory though and other tablets and touch screen users will get just as much out of using Bitwig – the pen just offers another expression level in pressure and a bit more accuracy in editing. There’s a couple of additional things they could do which would I believe improve on what they’ve done. Firstly the devices are a bit small and I talked about this in part 1 that they all look the same and could really do with an improved, enlarged, more groovy GUI. Along with that I’d like to see some sort of Macro controller where you could setup a bunch of very large and touchy controls that could be mapped to any available parameter. So for instance I could have the kill switches from the DJ EQ, the filter/cutoff from a synth, the same from a group or master – maybe even as vectors – just easy access to the parameters I would want to tweak in a performance without have to select the appropriate track to bring them up one device at a time. I can demonstrate this with an Emulator Pro overlay. On the editing side the touch toolbar at the top should be customisable to let you add whatever commands you need. There are some issues, some things that tripped me up or annoyed or boggled me but this is version 1.31 – they’ve only just started and so I get the impression there’s a lot more to come. And if the innovations shown here are anything to go by then it should be pretty bloody good. So I’m hooked – look out for a bunch of improvised performance videos coming soon. Surface Pro 4 or Surface Book – which one for music production? Thanks for this wonderful review! This has seriously helped my understanding of the way to modify my workflow! Ok, sounds good. But what is a good surface pro setup for producing/remixing? i5 or i7, minimum storage is …, surface 3 or 4? whatever you like mate. What’s good for you depends on a mixture of things like the complexity of your projects, your budget, your expectations, how much instrument library you’re using etc etc. Any Surface can do some producing and remixing, you’ve got to decide how much to invest in that. Cheers. Just don’t waste your time on Bitwig, it’s crap. Badly implemented, badly designed and full of weird random bugs. Just go for Ableton, it’s superior by design. Love reading your blogs as I have been a making-music-on-the-go idealist since netbooks first came out. I have an older windows tablet that I like to experiment with in search of finding the most realistic and usable portable option to edit and arrange tracks while I’m away from my desktop. Other software you might like to try for your tab is Reaper, where it’s native interface and plugins (which has native pitch correction) respond well to fat fingers, and then multitrack studio, which is built for touch, and things like the interface design and song editor (quickly arrange song sections easily) make for a straight-forward experience. Would love to hear your comments on those. Holy cats! This is fantastic! I tried Yeco, and was not dazzled by it. But this — you’re right, it’s amazing! It’s one of the few times when I’ve felt a software developer is really thinking through the potential for multi-touch on a full-powered compur. (StaffPad is one of the others.) Too often touch is just treated like a different form of mouse or touchpad, and so much is lost. Bitwig is my new friend!